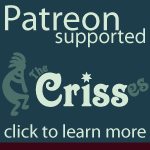 Criss1 was a personality construct. It consisted of discarded personality fragments from various portions of the system and people in our head. Usually it functioned as a mechanized veil with very little depth and a fairly complex autopilot function so that everyone else didn't have to be sitting behind it actively controlling it, until it took on too much willpower and we were unable to properly interface with it anymore. It was locking out front. We called this problem, once we figured out what was happening, "Crissing Out." The original Criss existed until about 1998, when we dissassembled it and returned it's component parts to their owners. We constructed a mask to take it's place.